This piston reducer fits the popular GM mid-size caliper with 2 1/2" piston. It is designed to help balance the front to rear brake bias by adapting a smaller piston into the rear calipers. To install this kit simply remove the original piston, seal and o-ring. Install the caliper piston reducer, Install the snap ring into the original o-ring groove and install the piston and pad spacer. Reinstall the caliper and you"re ready to go. The caliper piston reducer kit features a billet aluminum body that is anodized for added life, chrome plated, centerless ground, steel pistons that offer added life to the o-rings, Viton o-rings and a heavy duty snap ring. This kit is designed to eliminate the problem of too much rear brake on cars that must use OEM calipers. 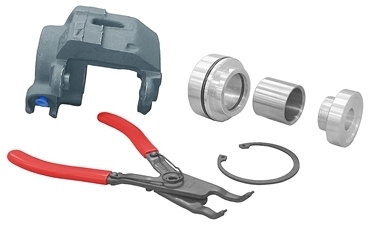 Due to the use of a heavy duty snap ring it is recommended to use the 45 degree snap ring pliers sold below for installation. Caution: If the snap ring becomes airborn during installation it has the potential to cause serious injury. Always wear safety glasses, a face shield or a full face helmet with face shield when installing this snap ring. Note: Caliper Not Included With Kit. "WARNING: This product contains a chemical known to the State of California to cause cancer and birth defects or other reproductive harm." - Select - Brake Caliper-Piston Reducer-GM-Metric-1 1/2" Piston Brake Caliper-Piston Reducer-GM-Metric-1 1/4" Piston Brake Caliper-Piston Reducer-GM-Metric-1 1/8" Piston Brake Caliper-Piston Reducer-GM-Metric-1" Piston O-Ring-Caliper Piston Reducer O-Ring-Caliper-1 1/2" Diameter O-Ring-Caliper-1 1/4" Diameter O-Ring-Caliper-1 1/8" Diameter O-Ring-Caliper-1" Diameter Brake Caliper-Piston Reducer Body-1 1/4" Brake Caliper-Piston Reducer Body-1 1/8" Brake Caliper- Piston Reducer Body-1" Piston-Caliper Reducer-1 1/2"-GM Metric Piston-Caliper Reducer-1 1/4"-GM Metric Piston-Caliper Reducer-1 1/8"-GM Metric Piston-Caliper Reducer-1"-GM Metric Pad Spacer-Fits 1 1/2" Piston Pad Spacer-Fits 1 1/4" Piston Pad Spacer-Fits 1 1/8" Piston Pad Spacer-Fits 1" Piston Snap Ring-Fits All Caliper Piston Reducers Pliers-Snap Ring-Heavy Duty-45 Degree Brake Caliper-Piston Reducer-GM-Metric-1 1/2" Piston Brake Caliper-Piston Reducer Body-1 1/2"